Hundreds of millions of people worldwide live in delta regions which are deteriorating under human pressure. Now they are among the first to face rising sea levels and other climate change issues, according to a new United Nations report. New studies of major deltas found a combined loss of wetland areas larger than Connecticut over the past fourteen years. The reduction is largely due to human development which damages the ability of deltas to regenerate. As a consequence, delta regions are at high risk of flooding from both seas and rivers, according to the UN’s Intergovernmental Panel on Climate Change. “If you look around the world’s coasts, the two areas you really don’t want to be are small islands and delta regions,” said Robert Nicholls, professor of coastal engineering at the University of Southampton in the U.K. and a lead author of the U.N. report. Since small islands and deltas lie just a little above sea level, rising seas easily threaten their existence. Deltas formed over thousands of years at river mouths, thanks to the buildup of soil and sediment which the rivers carried from miles upstream. The soil deposits created vast wetlands and barrier islands, which act as natural speed bumps to slow down the storm surge of water during hurricanes. While deltas naturally sink over time under the weight of the river sediment, they can usually replenish themselves with fresh soil deposits to stay above sea level. The continual turnover of new soil makes for fertile agricultural land, which allowed delta regions to give support the earliest human civilizations. But now the millions of people who flocked to these regions for their economic and ecological riches threaten the sustainability of the delta environments. Human-built dams, channels, and levees prevent natural processes such as river overflows from replenishing the deltas with fresh soil deposits, according to Nicholls. The result is deltas sinking faster. That leaves highly populated delta regions more vulnerable to various climate change impacts such as reduced fresh water runoff from mountain snowcaps that feed the rivers, or greater storm surges from higher sea levels and more intense hurricanes. “Deltas are the canaries in the coal mines for climate change,” said John Day, professor emeritus of oceanography at Louisiana State University in Baton Rouge. In this case, disappearing deltas would be an early indicator of accelerated sea level rise brought on by warming oceans. Some of the most vulnerable delta regions are in Asia, according to contributors of the United Nations report. China’s Yellow River delta has lost more than a third of its annual sediment deposit between the 1950s and 1990s, while the Yangtze River delta is expected to lose up to half after completion of the $25 billion Three Gorges Dam in 2009. “The Yellow River signature is happening very noticeably, while the Yangtze River side is coming due to the new dams,” said Zhongyuan Chen, professor of geography at East China Normal University in Shanghai and leader of the Asian Pacific Network, which urges more cooperation between scientists and policymakers on mega-delta issues. The sinking of the deltas makes it harder for China to protect large cities like Shanghai against storm surges from annual monsoons and storms. Rising seas only exacerbate the problem. “There are dikes on the coast, but they have limited effect because you have to elevate them every year, so it’s not sustainable,” noted Chen. The United States isn’t immune, either. 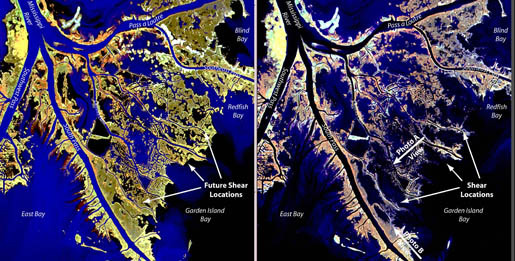 With the loss of wetlands that normally reduce hurricane impact, levees protecting New Orleans and other communities took the full force of hurricanes Katrina and Rita. The Mississippi delta itself has sunk by up to three feet over the past century. “We’re just coming to grips with how massively we’ve changed the [Mississippi] delta,” said Day of Louisiana. The current restoration effort in Mississippi focuses on building up wetlands by “reconnecting” the river to the delta plain and restoring its natural water flows. The project, which involves closing canals and channels, will bump up against other activities in the delta, such as agriculture, fishing, and oil and gas production; the region holds over 9,300 miles of canals from gas extraction and development alone. In the face of climate change, many of those canals may need to be closed to restore the deltas. Yet Day can empathize with families sentimental about their homes; his own family line goes back almost three hundred years in Louisiana. Through complementary hurricane protection and delta sustainability projects, he hopes to protect the Mississippi Delta —and his homeland — while showing the rest of the world how to better cope with climate change.